This heavy little book has been an interesting read on and off since I received it some years ago; and I don't have any intention of getting rid of it. This particular European artist has changed the face of nineteenth Century art and painting; however his brilliant skills as an artist were not recognised in his lifetime. Van Gogh was a prolific Post-Impressionist artist with a spectacular talent but his illnesses caused his career to be cut short. This book shows all the aspects of his paintings with a detailed commentary on all 120 of his works; with additional imagery to highlight comparisons and contrasts in his style. Some of these are considered to be his most important pieces; while others are less well-known. But all are uniquely Vincent. In more recent times, Vincent Van Gogh has been known to have a variety of illness ranging from Epilepsy to Manic Depression (the latter was most probably the cause of his suicide due to the lack of proper medications and diagnosis at the time). However, his art will always live on in the hearts and on the walls of art galleries; keeping other people who have these conditions positive that there's always a way to show how they feel through art; just like he did. I'm unable to find all that much on the net about these two people. However, I will keep looking and - of course - keep you all informed with anything I find regarding their works. However, I've done one better: I've tracked down the official website for you fans of Vincent Van Gogh and it's now on the sidebar where you find further reading (which I'll have to rename as it's turning into something completely different! hehe). So, there you go. As I'm unable to find the authors, you can join up as a Van Gogh fan online. I decided to put in a new section about what books I purchase and from where. Depending on how many books I've bought, well, that's how many I'll be putting into each post. So, I hope you enjoy. This month, I promised myself that I would buy only one book; and that would be 'Boundaries - Say Yes, Say No' by Dr Henry Cloud and Dr John Townsend. My GP recommended this one to me to help with personal issues. I haven't read that far into it as yet, but if I keep skipping over the parts taken from the Bible, I should be fine. I bought this from QBD at Garden City (http://www.qbd.com.au/) or you can purchase it online. My next book was an impulse buy. I had heard a lot about 'The Graveyard Book' by Neil Gaiman; and I saw it sitting out the front of Angus & Robertson with the sticker on the front as the '50 Books You Can't Put Down for 2009'... well, how could I dispute that? And as it said in the booklet containing this little book, once I've purchase it, I got to receive a free book as well. 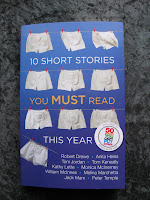 There was a choice between 'Grug' or '10 Short Stories You Must Read This Year' by a variety of Australian authors; and I chose the latter. So, there are my September book purchases. Until next month, Happy Reading! Bella Swan has made a major decision: she's going to live with her Dad in Forks. Forks is a small town far away from Arizona where she is used to the brilliant sunshine, being at a massively-populated high school and pretty much in amongst a huge city. When she arrives, she realises she may have made a big mistake; but she wants to get to know Charlie - her Dad, who's the police Chief of Forks. And so, Bella begins school, puts up with the slow dial-up internet and the huge, noisy truck that almost dies when she pushes it to go over 50 miles an hour. A guy at school catches her eye. He's tall, beautiful and has the most gorgeous topaz eyes; but he won't give her the time of day. Edward Cullen notices her in a heartbeat, and finds from day one, he's forever rescuing her from herself; or is it something else? After all the hype about how great this book was and how brilliantly written, I began hearing how much like 'popcorn for the mind' it was also. So, like any teenaged vampire series, I decided not read it. However, fate changed that when my parents came across some poor person's birthday gift scattered across the parking lot of a park one afternoon; and this book was amongst the notebooks and stickers. 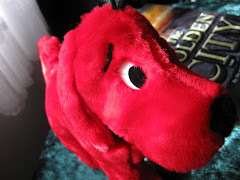 So, of course, I took it in and put it onto my shelves; not thinking much of it at the time - until I received a parcel in the mail with 'New Moon' inside it with other books also. So, I folded and read this book. By the end, I felt very let down. Yes, I zoomed through in a week; but it didn't have the big tension I was expecting a vampire novel to have - even if it was for teenagers. I'm afraid to say, but I have read better. Stephenie Meyer graduated from Brigham Young University with a degree in English Literature and now lives with her husband and three sons in Glendale, Arizona. When I was around fifteen years of age, I wanted to learn Australian Sign Language to communicate with my next door neighbour's son. We'd talk over the fence, but finger-spelling was getting old and I'd often forget what I had been saying all due to needing to spell correctly. So, I attended night school and learnt about the silent world of the hearing impaired. I was the youngest in my class and the college I attended was situated in the worse part of Brisbane at the time (South Brisbane TAFE); and I was also working my way through high school as well! 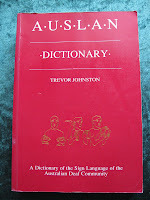 Then, we were advised to purchase this dictionary to help our signing along; so we'd understand it better. I had to beg my Dad for the $50 or so it cost to buy the book (firstly having to put in an order for it). Now, twenty years later, I still have this book on my bookshelf, and I still use it at various times. 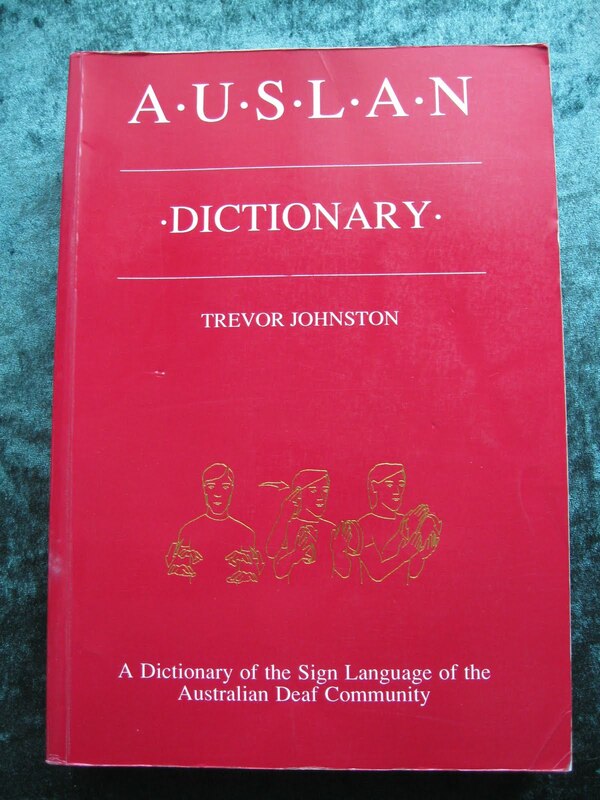 Auslan (Australian Sign Language) rarely changes; however, the dictionary does get reprinted once in a while. Now, the cover of this one is a little old; however, what's inside it is invaluable to me and anyone else who is serious about signing and communicating with the hearing impaired. I still sign to anyone who signs to me. It's just something I have done since learning this wonderful language. There is a steadfast rule I live by though: I never, ever, eavesdrop on two - or more - people signing in public. Their conversation is private and their own; and they can't help it that this is their only way of communications. In fact, seeing I've visited their silent world a few times and feel it's not them who are missing out, it's us. I'm not sure who wrote the dictionary or the history of it. However, I have e-mailed the Queensland Deaf Society for more information and am awaiting a reply. If you'd like to know more about them. I've put in a link on the side bar where the other sites for book-related sites are. It will stay there permanently for anyone to use. This book is a difficult read. I have found it one of hardest since 'On the Road' to get my head around; yet I don't like giving up on books just because they're hard. Erving Goffman covers a lot of facets about the human mind and how we have a personality for each part of lives; from our lovers to our parents, our friends, relatives and even when we go out to a restaurant, we put on another personality. It's all about making sure our true one doesn't get out and ruin things. But then, there's people who don't restrain their true personality and that's where others think they're either asking for trouble or they're 'free spirits' and wish to be like them. Seeing I'm barely halfway through it, I won't make a judgment on the book just yet. However, if you want a challenging read, this is definitely a good choice; but it's also brilliantly researched and I'd like to know more about his footnotes (this is probably why it's taken me so long to read this book!). I received this book from a person overseas thinking it would be a really good psychology book to zip through; seeing that I've read a couple of them, I kind of thought it would be easy. But I was mistaken. I've had this book for over a year and I'm hardly halfway through it. I call this my 'bus stop book'... a book to read while waiting for the bus. It's not boring, but it's not so great I get lost in it and forget the bus is coming. Erving Goffman received his bachelor's degree from the University of Toronto in his native Canada in 1945. His master's and doctorate were granted by the University of Chicago in 1949 and 1953, respectively, where he studied both sociology and social anthropology. While working on his doctorate, he spent a year on one of the smaller of the Shetland islands gathering material for his dissertation and his book The Presentation of Self in Everyday Life, 1959; which is available in at least ten different languages and has been almost continuously in print. In 1958, Dr. Goffman joined the faculty of the University of California at Berkeley and was promoted to full professor in 1962. He joined the faculty at the University of Pennsylvania in 1968 where he became the Benjamin Franklin Professor of Anthropology and Sociology. In 1977 he was awarded a Guggenheim fellowship. Just prior to his death, Goffman served as president of the American Sociological Association in 1981-1982. Dr. Goffman's primary methodology was ethnographic study, observation and participation rather than statistical data gathering, and his theories provided an ironic insight into routine social actions. 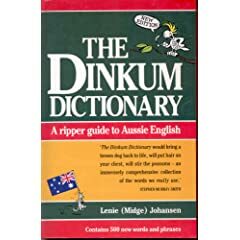 What a ripper of a dinki-di book this is to translate the Aussie slanguage that we've proudly been working on for the last two centuries so that anyone else who is still learning it can follow a conversation. All through my life, I've been using Aussie slang to communicate and never really thought much of it until I began traveling overseas and people asked me to repeat what I had just said to them. And from the looks on their faces, they really didn't understand me. So, I had to: 1. slow down my speech and 2. use the Queen's English and not the bonza slang I'd been taught. There's been a few more editions of this dictionary since I was given this particular one. So, if you're in the market for an Aussie dictionary for either a souvenir to take home or a good laugh, this one is totally worth it! A word of warning, though. This dictionary on the translation of Aussie slang has a fair bit of racist words in it. This isn't any fault of ours; this kind of language has been used over the last two centuries and has stayed in the vocabulary because of its age and where it came from. I personally don't use racist language of any kind to describe people; I just own the book because some of the words are funny in sound and meaning. I've searched the net for Lenie Johansen's website - or anything on him - however, I just keep coming up with this book. The one thing I've found out is that he was born in 1950 and is still alive; and that's all. 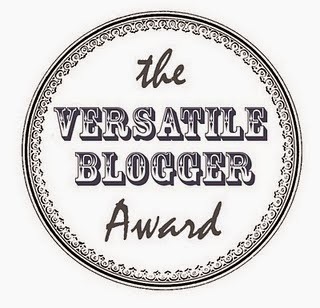 So, if anyone has a site for him or knows of any other books by him, please leave a comment for us so I can add his name to ever-growing collection of author links on the sidebar. Thanks. What a book! I received this one Christmas and it's a book of all the film posters from the 1990's of every movie that came out. There's ones there from America, Australia and overseas; which means it shows posters that haven't been shown in some countries. This book is in full colour, glossy pages and well worth the look at what Hollywood and other movie companies have been doing all over the world. I personally don't look at it too much as I like to keep this kind of book in as pristine condition as I can; so this one still smells and looks brand new. However, as the decades roll on, there are bound to be others just like it documenting the movies that have come out each and every decade. And if the movies in this decade are anything like they were in the 1990's, well, I think we have a lot to look forward to. I'm unable to find too much about these two guys on the net. Tony Nourmand has an extensive publication of books about films from each decade starting with the 1950's or so right through to today; well worth a look into if you're interested. Tony has also published the same kind of poster books about horror films, Audrey Hepburn, Alfred Hitchcock, Sci-Fi and other genres. I'll put the link to the site with all his books on the sidebar and you can all have a look into the world of film posters; it's amazing. What would you do if one of your friends offered you to take part in purchasing a $20,000 diamond necklace? Me? I'm not really sure. However, I would make sure I had the money first just in case I was going to take up the offer. One thing for sure, it would be a once-in-a-lifetime kind of deal; and it would be a lot of fun! Well, this is what this book all about. Thirteen women and one very expensive necklace in a Californian jewelry shop. What took place between these women was astonishing. All of them were from very differing backgrounds and some of them hadn't even talked to each other until this offer came up. They ranged from introverts, real estate agents, divorcees, single mothers and a catholic school teacher to the woman who started it off. Now, I'm not going to give away the whole story here. I'm going to let you be the judge. If you've ever traveled with children, you'll know it can be either fantastic fun or pure hell. Well, traveling around the Big Apple is no different; and this sweet little book makes doing just that a whole lot easier for you! This book covers everything your kids would ever want to do; and you'll also find the outings fun as well. From Chinatown to Metropolitan Museum of Art to inline skating by the Hudson River, this book will take you and your family all over New York City in the name of fun for all around. And not one of you will say they're bored. This book makes things much easier for you with mud maps, addresses, websites, phone numbers and pretty much anything else you'd need to make getting to your destination a cinch! It has suggestions for meals, lunches and light snacks too. So, while you're planning your next trip to The Big Apple with your family, hunt down this book as well and pack it into your suitcase (buy two in case your kids are conflicted on what they want to do and both of you need to split up in the name of keeping the peace! Also, then you won't get lost when you meet up again later on). Alfred Gingold grew up in New York City and studied theatre and English at Cornell University. He has worked as a director, actor, and teacher in New York and further-flung localities. Today he lives in Brooklyn with his wife, son and their dog, George. Alfred Gingold has written for numerous publications, including Esquire, GQ, Harper’s Bazaar, My Generation, The New Republic, The New York Times, New York Woman, Travel & Leisure, Worth and, of course, Queste, the journal of Rolls Royce owners. “Don’t Ask,” his humor column on the Prodigy Internet Service, was named one of the ten funniest sites of 1996 by Yahoo Internet Life. He covered the Westminster Dog Show for Slate in 2002. I haven't found that much about Helen Rogan; except that she is in the publishing world. There's no mention of an official website or any biography I'm afraid. So, I'm sorry to say that I'll keep on searching for you guys until I find something about her. I love reading Bill Cosby's books. He's a funny man and knows how to make me laugh; and this one made me laugh just as much as 'Time Flies'. This book covers his territory of humour. The way it's written feels as though you're sitting with him and he's telling you a story over a cup of coffee; it's absolute Cosby from beginning to end. He tells unforgettable stories about all kinds of things from his heroic quest for Spanish Fly and his day as a school crossing guard - when he fell dizzily in love that he almost waved his heartthrob under a bus to comic insights about kids today. He also covers the antics of the smaller ones and how funny they can be from that innocent age of bad table manners, coping with the death of his childrens' pets and his own days spent smoking in the boys' room; out playing street football; then lusting after Wonder Woman back at home. This is definitely worth a read and a good giggle. I read this wonderful book when I need a good laugh and pick-me-up; and I highly recommend it. I've reviewed another of Bill Cosby's books here and have included a link to his website on the sidebar. Feel free to go to it and find out more about him.